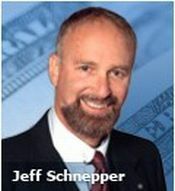 Jeff A. Schnepper is the author of several books on finance and taxation, including How to Pay Zero Estate Taxes and all twenty-five previous editions of How to Pay Zero Taxes. He is a financial, tax, and legal advisor to the Transamerica sales force and runs a full-time accounting and legal practice in Cherry Hill, New Jersey. Mr. Schnepper is Microsoft�s MSN MONEY tax expert, an economics editor for USA Today and is tax counsel for Haran, Watson & Company.